Cincinnati is blessed with one of the most dramatic skylines in America. The majestic hillsides and river help frame the diverse collection of high-rises dating back to the early 20th Century. Cincinnati was fortunate to have the works of such architects like Daniel Burnham, James W. McLaughlin and more presently Daniel Libeskind. This list of course not including the slew of famous architecture firms that produced many more notable high rise beauties in the Queen City. 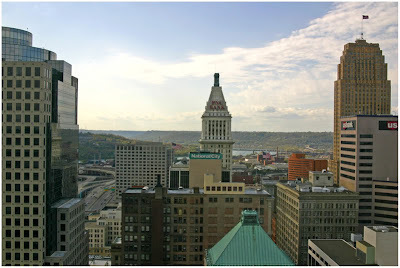 On Saturday, March 6 at 10:30am, the Cincinnati Preservation Association (CPA) will present part two of "The Skyscraper District" lecture series. Part two will focus on innovation and tradition in Cincinnati's high rise office buildings from the turn of the last century until the Depression, and will be presented as an illustrated lecture by architectural historian Walter E. Langsam. The lecture will be held at the historic Gwynne Building located at 6th & Main streets (map) in downtown Cincinnati. Tickets are $7 for CPA members, $12 for non-members, and can be purchased at the door or by calling CPA at (513) 721-4506. Signs and CPA volunteers will instruct you where to go once you arrive at the Gwynne Building lobby.